Traveling will broaden your horizons in ways that little else can. You get to see places that are unfamiliar to you, experience culture and art that is far removed from your own reality, and nothing from home can bog you down. The only hard part is trying to get everything you need from home into a bag that will keep all of your stuff safe while you’re on the plane that takes you to your destination. Most luggage at home is kept in a storage area that is out of the way so it doesn’t take up space or look unsightly. Of course, if you travel more than 5 times in a year, having to pull it from the out-of-the-way space is kind of a pain. If you want to keep your carry-on bag in closer proximity to you than the very back of the closet or in the attic, then the Barracuda will be your new best friend. This is a collapsible rolling bag that can fold down to 4 inches when you don’t need it, and can be a hard-sided carry-on when you do. Of course, anything that’s going to cost you $210 or more is going to have to have more bells and whistles than just folding down conveniently to be justifiable. 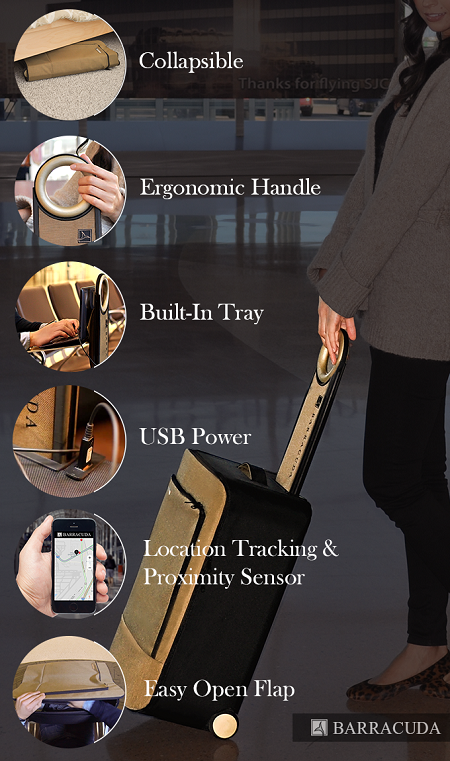 This has a built-in tray for working on the go, GPS tracking, and an ergonomic swivel handle to make moving around easy peasy. When you’re traveling, you might want a little extra juice for your phone or tablet as well, so it’s pretty helpful that this has a built-in backup battery that can charge your smartphone 5 times over. This is available in blue, red, grey, and gold once the crowdfunding campaign ends.